And the winner is…. Ministerie van Tekst! During winter 2018/2019, we are holding our START2ACT Energy Saving Challenge. This competition asks small businesses to show us how they reduce energy in the office. The monthly prize draw for December 2018 is completed and we can reveal that the winner is Ministerie van Tekst of the Netherlands. Ministerie van Tekst is a young agency for text production and editing. Founded in 2014, the company specializes in text editing and interviews, especially in the field of technology and digital transformation. They also provide basic writing workshops for low-literate people. 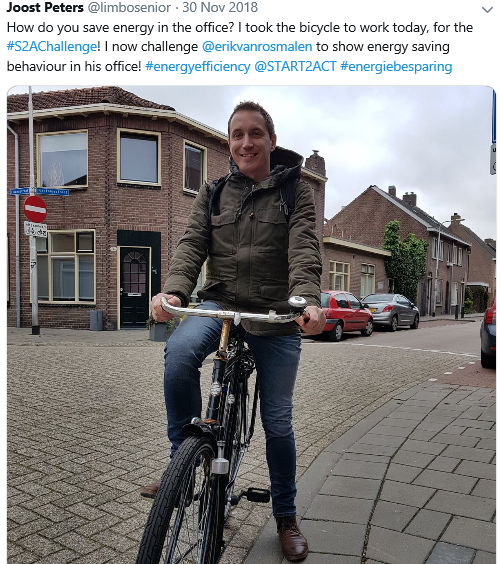 Head of the company Joost Peters showed us on Twitter how he reduces transport energy impact by cycling to the office in his daily commute. This is a low-cost energy saving initiative available to every organisation. Ministerie van Tekst will receive a Bamboustics green speaker and an energy saving starter pack for its winning entry to the START2ACT Energy Saving Challenge. Thank you to everyone who participated in the competition and to those who spread the word. We hope you all are enjoying the challenge! Until the end of the challenge, we will have two more prize draws for two Bamboustics speakers and will give one smart Energomonitor to the best entry of the entire challenge.